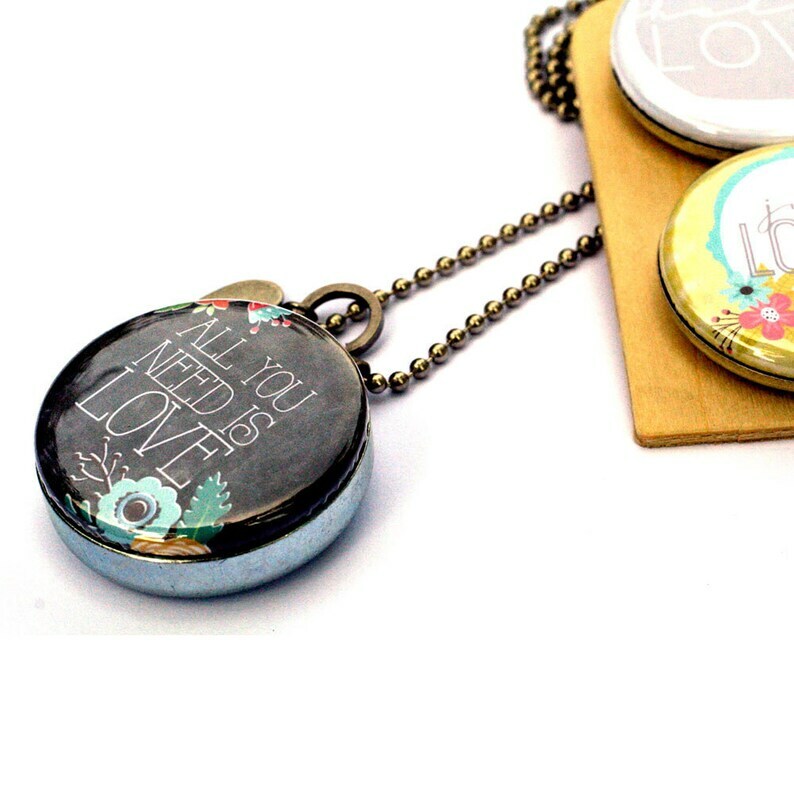 THRU 12/19 WE WILL BUMP ALL U.S. ORDERS TO PRIORITY MAIL TO HELP ENSURE CHRISTMAS DELIVERY!This inspirational necklace is a magnetic locket with 3 interchangeable lids - all featuring magical and motivational artwork including the chalkboard quote - ALL YOU NEED IS LOVE, thought bubble - HELLO LOVE and the floral JUST LOVE. This is the perfect gift for someone you love and a wonderful keepsake locket to purchase for yourself. Polarity Lockets are the ORIGINAL magnetic necklace since 2007! ★ Your locket is 1.25"
★ Your locket ships in gift tin perfect for gifting and storage and always includes a FREE EXTRA LID! This is one of my new artists collaboration lockets featuring the magical positivity of Jande from Inspire Your Art in Salt Lake City, Utah. Jande says, "I have found a love for motivational words and the graphic arts. I get my inspiration from famous and some not so famous people. I love the arts and have found my niche to add a little inspiration to the world when we need it most. ."
We are so lucky to have 3 of her beautiful and inspiring illustrations for your locket! All Polarity Jewelry™ including the changeable magnetic top is © 2007-2015; all designs used on the jewelry are © Inspire Your Art and used here with permission.